This home needs to be viewed and only then will you appreciate the fantastic all day sun, flat back lawn and expansive views. It is why this family have adored living here for more than 50 years. 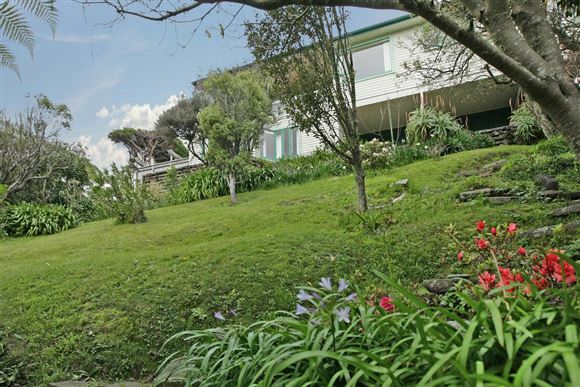 This solid, three bedroom home, has stunning original 1960's features including rimu floors, rich timbers and large picture windows. The spacious, separate lounge opens to a large front deck offering great indoor-outdoor flow. The second living room combines with an open plan kitchen-dining room providing the home with a lot more space than you would think. Both have a wood burner, making the home snug in winter. Entertaining and family living is a delight whether it's on the front deck or rear lawn. Flat access is provided by a cable car nearly to your door. There is also a self contained studio with its own private outdoor patio. This offers many options for couples or families - can help pay the mortgage or would be ideal for extended families. Located in this ever popular suburb, it is in the Wellington Colleges zoning. RV$520,000. This appealing property should attract strong interest, so don't dither.